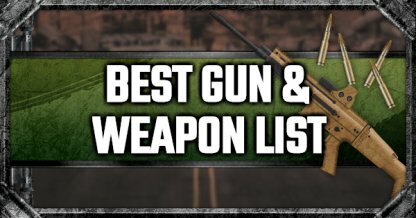 Check out this PUBG Mobile Best Gun & Weapon guide for more info on gun and weapon ranking and tier list, weapon combinations according to effectiveness, damage, stats, and more! In PUBG Mobile, only the best guns can get you to the top! Weapons ranked in this list are based from the GameWith's team's experience - considering effectiveness, stats, damage, etc. Obtainable only through supply drops. Strong damage that can penetrate a Level 3 helmet! Found only in supply drops. One of the strongest damage in Assault Rifles. One of the best damage and firepower in PUBG Mobile and are only found through supply drops. If equipped, be sure to actively hunt enemies and take them down with their massive DPS. Can only get through supply drops. A more powerful version of Kar98K. Supply drops loot only. Easy to use & shots are stable due to its low recoil. Low recoil with a big magazine capacity. Slow reload speed but attachments are unnecessary to be effective. 100-bullet magazine so you can shoot all you can! Reloading is long so reload when out of combat. Effective in all situations with high firepower. Equip all attachments to increase damage & usability. The A Rank weapons are very effective in most situations - high damage, low recoil, with ample amount of bullets, making it easy to get you or your team to the top ranks! This weapon has high damage but has very high recoil so shoot in bursts to control gun movement. Equip attachments- to control recoil & stability, making this weapon even more powerful. Shooting is unstable so fire in bursts to control weapon's recoil. Not as powerful as others but accessible and one of the few sniper rifles lootable from the ground. This marksman rifle has large DPS and rapid fire rate but has high recoil. Another marksman rifle with high amount of recoil but has higher damage & fire rate than the SKS. This DMR is capable of going full-auto and is only available through supply drops. B Rank Weapons are still beginner-friendly with enough fire power and magazine size to keep pressuring opponents throughout the match. Powerful in short range combat. Equip an extended magazine for sustainability. Can be used as an alternative to an Assault Rifle. Has low fire power but also very stable due to low recoil. Not as powerful as other marksman rifles but is easy to use & has low recoil. Extremely high damage in short range. Effective in close quarter fights where opponents are not fully-equipped. A very beginner-friendly shotgun that is capable of going full-auto for rapid fire shots. Use Only When Certain Situations Call For It! C Rank weapons are more complicated and should be used only in certain situations - shotguns & SMGs for short range combat & the Mini14 for long range fights. Weapon comes with built-in suppressor & scope but damage output is low and bullet drop is very high. Effective during early stages of the game but lacks attachments such as sight. Has low magazine capacity so equip an extended magazine to increase sustainability. Has fast fire rate and not as powerful in mid-long range combat, utilize in short range fights! Powerful in the early game but damage & firepower is lower than most shotguns in-game. Aim for a headshot for a one-hit kill! But be wary of surrounding enemies during reloading. D Rank weapons are hard to use due to low damage, small bullet number, or limit in range of effectivity so players should use them only in special situations. The M416 has high DPS and low recoil - stable and easy to use. For long range, the Mini14 can also be used effectively. Both weapons also use 5.56mm ammo so no need to look for two types of ammo. The DP-28 has strong damage & isn't hard to use. For long range, the Kar98K also deals good damage. Both weapons are simple & effective - great combination for players used to the game. Both weapons have very high damage & combat sustainability, making it easy to take down enemies. This duo is effective for veteran players who know how to control weapon recoil.